I woke up today feeling a distinct sensation of panic. Tomorrow is co-op, Fine Art co-op, and I am teaching the "art" in that title yet I had nothing to go with. Usually I am pretty prepped--at least in my head. Recently though, my head has been a giant swirl of vendor lists, ship dates, and memos to myself in what I like to term my mental ticker tape. The ticker never stops and the feed keeps going and I have to keep up! So. I thought, dragons...HEY! I can teach them about Chinese dragons! And then they can draw them! How extraordinary is that? (I know, just humor me. We all need these happy moments. LOL) So, I started with my trusty Google and I found so many cool things! Did you know that dragons have been in the Chinese culture for thousands and thousands of years? 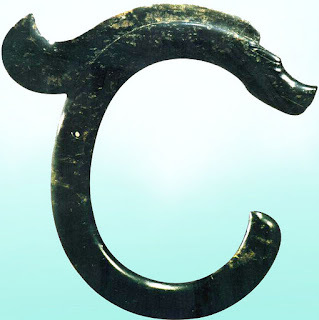 I mean I knew they were old, and I knew ancient cultures had their legends and even Draco the dragon is in the night sky, but still - some of the ancient jade finds have been dated to close to 6,200 BC! 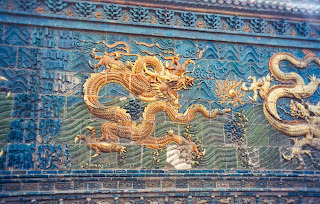 Chinese Dragons from the Nine-Dragon Wall. 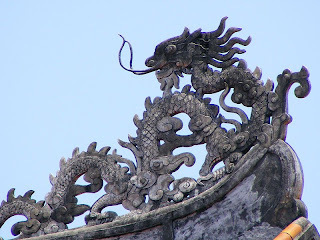 In yin and yang terminology, a dragon is yang and complements a yin fenghuang ("Chinese phoenix"). The next picture is an ancient artifact. I wonder what it was used for. What do you think? The origin of the Chinese dragon is not certain. 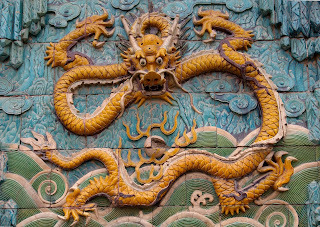 The presence of dragons within Chinese culture dates back several thousands of years with the discovery of a dragon statue dating back to the fifth millennium BC from the Yangshao culture in Henan in 1987, and jade badges of rank in coiled form have been excavated from theHongshan culture circa 4700-2900 BC. 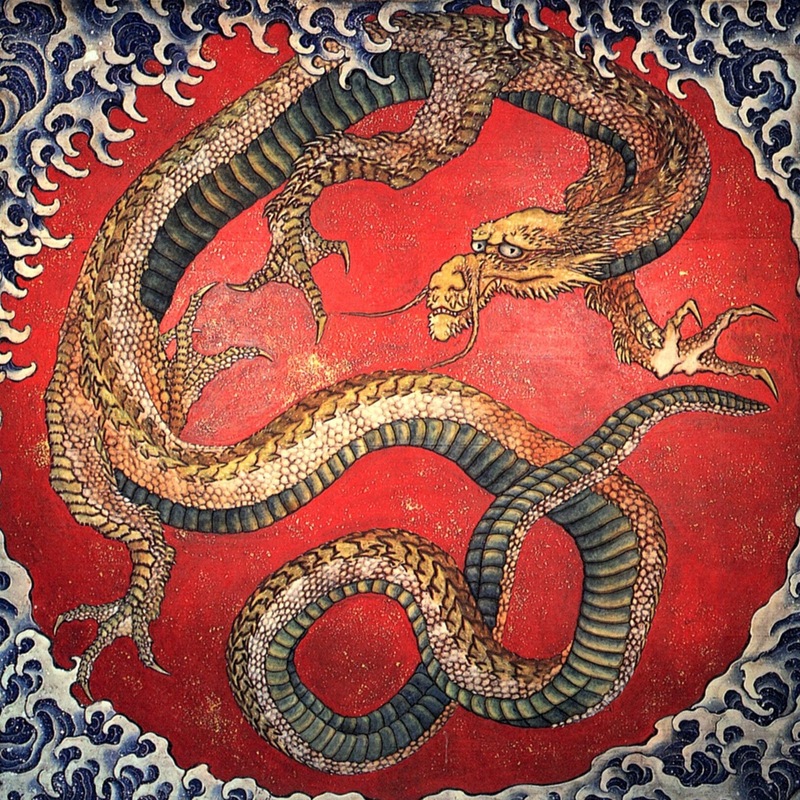 The coiled snake or dragon form played an important role in early Chinese culture. The character for "dragon" in the earliest Chinese writing has a similar coiled form, as do later jade dragon amulets from the Shang period. Ancient Chinese referred to unearthed dinosaur bones as dragon bones and documented them as such. For example, Chang Qu in 300 BC documents the discovery of "dragon bones" in Sichuan. The modern Chinese word for dinosaur is konglong (恐龍, meaning "terrible dragon"), and villagers in central China have long unearthed fossilized "dragon bones" for use in traditional medicines, a practice that continues today. 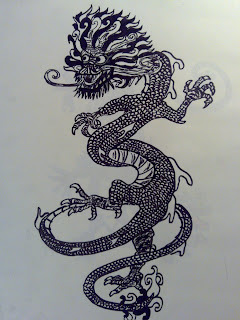 The dragon is a very revered creature in China that has many symbolic meanings in Chinese culture. Unlike the European dragon, the Chinese dragon is a creature that symbolizes auspicious omens and is a symbol of good luck, fortune, and power. 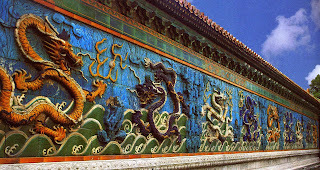 The Chinese dragon also, according to legend, symbolizes control over water and bodies of water, such as rain, floods, waterfalls, rivers, and typhoons. The following is just lovely and in an entirely different style from the other things we are studying. From Wiki: Detail of an embroidered silk gauze ritual garment from a 4th century BC, Zhou era tomb at Mashan, Hubei province, China. 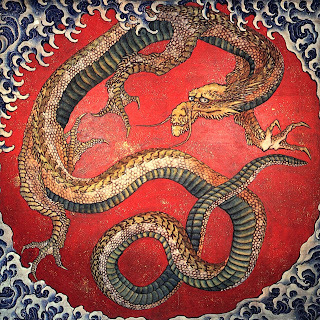 The flowing, curvilinear design incorporates dragons, phoenixes, and tigers. Below is a neat dragon from the 13th century.I love his expression! 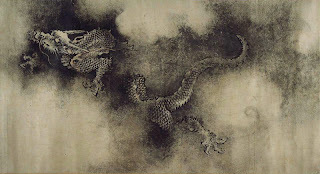 From Wiki: One of the dragons from The Nine Dragons handscroll (九龙图／九龍圖), painted by the Song-Dynasty Chinese artist Chen Rong (陈容／陳容) in 1,244 CE. Ink and some red on paper. The entire scroll is 46.3 x 1096.4 cm. Located in the Museum of Fine Art - Boston, USA. 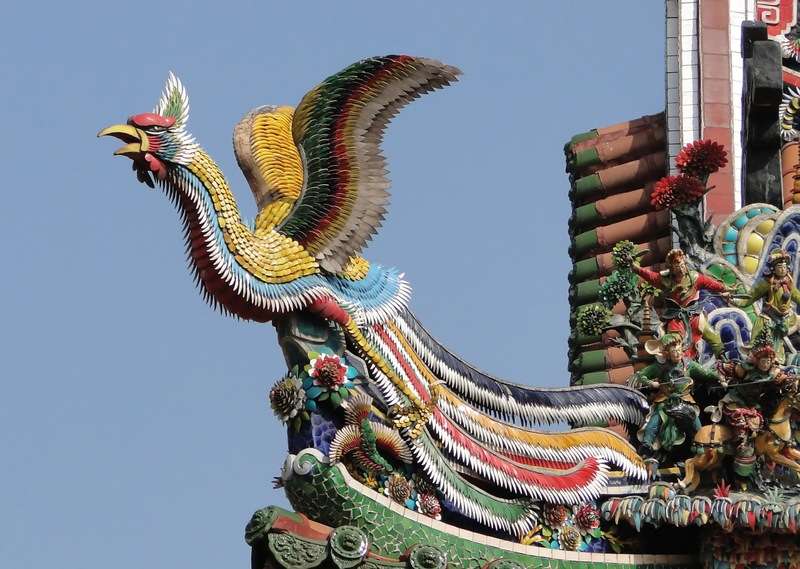 Chinese culture isn't the only one with a score of interesting dragons. Bhutan has its own dragon stories. The country's flag is below. 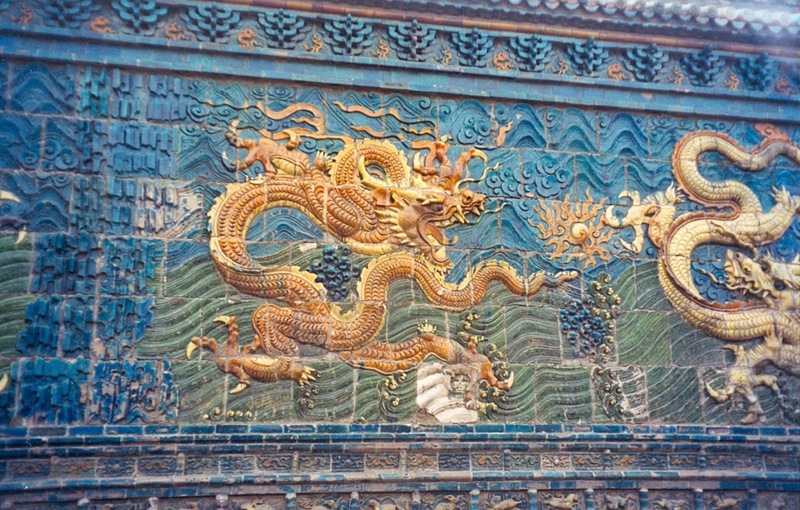 The dragon is holding gems as a symbol of wealth. 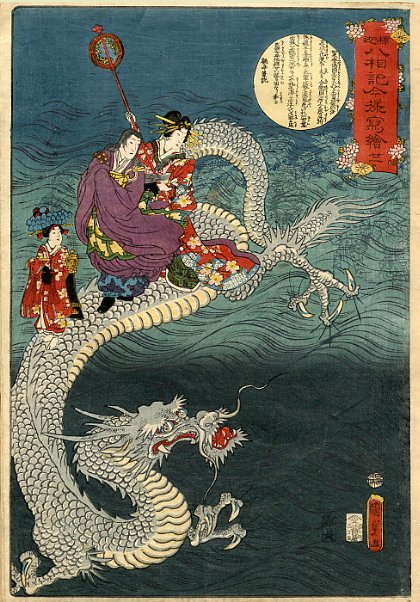 Japanese dragon art is one of the most familiar in the world due to two artists; Hokusai (the first right below) and Utagawa Kunisada (the artist that created the dragon below with people on it). These are some of my favorites. I love the detail and the expression on the faces. 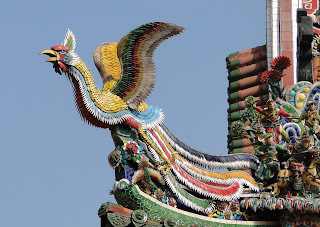 Below is a Korean Dragon. I think his face looks like a lion's face. The last is a Vietnamese dragon. I like the swirls in the metalwork here. I think it might be neat to consider that dragons are not entirely fictional. There are certainly fossilized creatures we have found today that look an awful lot like some of these dragons. This video is a 3+ minute video of a compilation of several ancient creatures that we can only see in fossil format today, but this video brings them to life. As I watched this, I remembered that these are swimming creatures and would have been made by God on the fifth day of Creation. They are swimming reptiles and are really quite magnificent. I can't say the music is what I would have chosen, but the video had some interesting shots. $275 Worth of Homeschooling Products for Only $20! I was thrilled when Mr. Notgrass agreed to send in his Exploring America for review. It is a most excellent program and I am thrilled to be using it in our family and our history co-op. 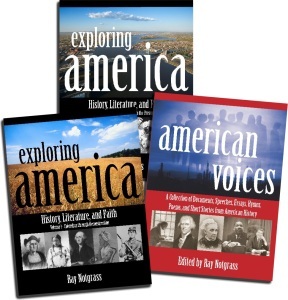 Exploring America, from the Notgrass Company, is a thorough and engaging high school American history, American literature, and Bible course. The complete course comes with two softcover student textbooks, (Exploring America: Volume 1 – Columbus through Reconstruction, Exploring America: Volume 2 – Late 1800s through the Present), another softcover book, American Voices: A Collection of Documents, Speeches, Essays, Hymns, Poems, and Short Stories from American History, a spiral-bound softcover Quiz and Exam Book and the answer key for the same. Volumes 1 and 2 have a combined total of 150 lessons that are divided into thirty separate units of five lessons per unit. Exploring America fulfills three high school credits. From the website: Completing the full course provides your child with a year's high school credit in American History, English (literature and composition), and Bible. The History credit involves reading the lessons and the original documents and speeches (and answering the questions in the optional Quiz & Exam Pack if desired). The English credit involves completing the weekly writing assignments and one research paper; and reading the assigned literature, poems, and short stories in American Voices. The Bible credit involves reading the Bible lessons, completing the Bible assignments at the end of many lessons, and reading the hymns and other religious literature assigned. A week (or unit) of study encompassing five lessons from Exploring America begins with the Unit Introduction. The Unit Introduction gives the student a concise write-up of what will be covered in the unit over the five lessons in the week. You will be given a memory verse to learn, a list of other books used (literature selection and American Voices when needed) in addition to the Volumes of Exploring America, and then a choice of writing assignments. For every lesson, the student will read the material in the textbook and then complete the assignments. Sometimes this involves answering questions given and sometimes it involves multiple days of writing for the same assignment. For example, Unit 8 has two writing assignments offered and the student chooses one. · Write a two to three page report on the contributions of the Adams family to America, especially John and Abigail Adams, John Quincy Adams, Charles Francis Adams Sr., Charles Francis Adams Jr., and Henry Adams. · Write a two to three page paper in which you compare the religious experience in the Massachusetts Bay colony and that on the frontier during the Second Great Awakening. As you can see, these assignments will take more than one day to complete so the other days they will do reading of the literature selection or American Voices, memorize Scripture, or answer the lesson questions found in the Quiz and Exam Book. Throughout the books, you will find many appealing side notes, graphics, photographs, maps, and sections that were especially interesting, What Was Happening In the World? This section gave world history events of significance and facts about individuals living at the same time to help with context. For example, did you know that Napoleon crowned himself Emperor or that Beethoven’s third symphony premiered one year after the landmark Supreme Court case of Marbury vs. Madison? It is helpful to see American history in the proper framework of the rest of the world. The fifth lesson of every unit is a Bible study. 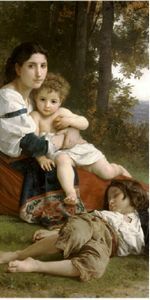 Your child will study such interesting and applicable subjects as: How You See the World Makes a Difference; God is Sovereign; The Bible as Spiritual Constitution; Faith on the Front Lines; God and Freud; The Dilemma of Suffering; Were They Really the Golden Days? ; Public Leaders, Private Lives, and many more. Obviously there is some author opinion in these sections, but that is what makes it great for thinking and reasoning out. You can use these as opportunities for great family discussion too. There are questions to ponder and answer and Scripture to discover here. The American literature selections are solid well-respected choices worth the time your student will take to read them. In the Quiz and Exam Book, there are questions for the student on the book. Each lesson has questions to ask and answer on the subject in that lesson. The quizzes and tests also found in this resource are multiple choice as well as paragraph format. Probably the single neatest aspect to this complete curriculum is the book, American Voices. There is just nothing like reading an historical figure’s own words to get to know them and why they cared so deeply about whatever they were involved in. Their stories, poems, essays, hymns, speeches, and of course, the most important historical documents they created make the study of history come alive. You will find such treasures as excerpts of the New England Primer, saying from Poor Richard’s Almanack, George Washington’s Farwell Address, the response of W.E.B. Du Bois to Booker T. Washington and Others “…on the best path to take for black equality and opportunity” and his essay is shared here. The reason I love history so much is because it is a great compilation of peoples’ lives and thoughts. Many people view history as a bunch of dates and wars. While there are many important dates and too many wars, it is the people behind these events that lived during these dates that make it worth our time. We are living in our own historical time period, but we ought never to forget those that went before us. We have much to learn from them if we only give them the time. Notgrass History has been an exceptional way to do this. I highly recommend it! A beautiful hymn was sung today at our church. It touched my heart. I wanted to share it here with you. I hope you find it as lovely and truth-filled as I. And light and life obeyed. And stills the tempests’ roar. Can thwart Your perfect plan. Earth’s every knee shall bow. We trust and worship You! Well. It has been quite a week. Many of you know that I have run the dynamic review team at The Old Schoolhouse Magazine for over eight years. The team is merging with the TOS Homeschool Crew and I am taking the helm of the ship. It is exciting and daunting and thrilling and terrifying all at once. 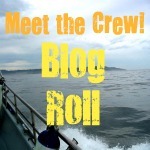 :) There are about 200 crew members that blog their reviews and link up to the TOS Crew site. How cool is that? I am feverishly learning all I can and there is much to learn. Whew! In our science/history co-op, we are wrapping up our study of the Civil War. We have been using a variety of resources (Notgrass History, Time Travelers, History Pockets, and important literature resources like Narrative Life of Fredrick Douglas, The Last Brother: A Civil War Tale, Across Five Aprils, Uncle Tom's Cabin, and Rifles for Watie) but probably the most moving and the one that has left its mark is Ken Burns: The Civil War. It was such a tragic war in so many ways, but the loss of life takes my breath away. May we never know such loss. We are also studying Jay Ryan's, Classical Astronomy. What an excellent excellent book! I remember posts by Jay on a board I used to frequent that discussed the making of this book and now we have it. We also own his book, Moonfinder, and it explains the phases of the moon so that someone as dull as I can understand it. :D I love the night sky. I love the moon. I love that the moon we see is the same one that Abraham looked upon in the desert and that Jesus saw from his home. There is something powerful to me about that--that sameness of light in the sky that speaks to the glory of God. Jay brings much of that to life. I can't recommend his books enough. I must be off. I have had a good homeschool day even though we didn't get everything done. Some days are like that, aren't they? However, it was a really good day.